Are you lucky enough to have a President’s Day vacation from work? The kiddos are home from school and we have a trip to the zoo planned since it is supposed to be in the 50s today. I am excited! Last week was so crazy busy I feel like my head is still spinning and added to the busy week we had to have Mr. Rooter come over to clear out the drain pipe. Not exactly my idea of a good time. Now it is a new week –a better week –a hopefully less busy week. Whether you got a long weekend due to the President’s Day holiday or you still had to clock in Monday morning I hope your week is off to a fantastic start! Going out for dinner is fun. Taking a break from doing all the cooking is welcomed as is getting to eat something that you may not know how to cook or want to fiddle with. Sometimes it seems like restaurants are the keepers of good food secrets. In college when my parents or grandparents would come to town we would inevitably head to Texas Roadhouse. They served good steaks, yummy chicken critters (hand-dipped chicken strips), and a constant basket of their freshly baked buns with cinnamon butter (heaven I tells ya). I’d frequently order a steak and loaded baked potato. 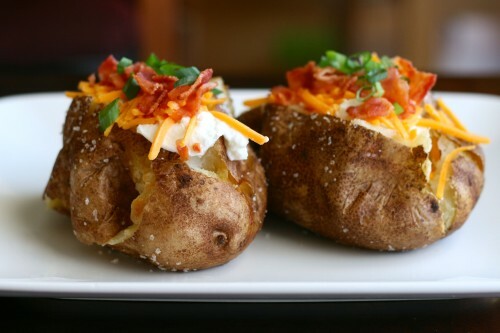 Restaurant baked potatoes were always better than homemade. The skins were crisp and covered in salt. Plus there was always butter, sour cream, cheddar cheese, and BACON. I would always always order my potato loaded because it seemed so fussy to have all those ingredients on hand when I was cooking in my tiny college apartment kitchen. 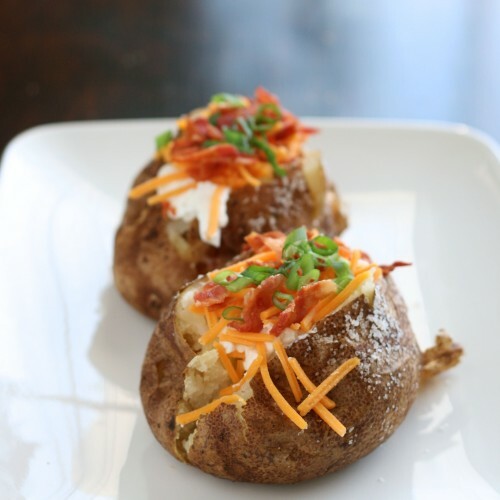 You may have noticed I said, “Restaurant baked potatoes WERE always better than homemade.” That is because I have the secret to the crisp and salty baked potato skin. Now my homemade baked potatoes are as good if not better than those restaurant taters. No more waiting in line for 45+ minutes or having to watch the wait staff line dance to “Cotton Eyed Joe” for the umpteenth time. All you need are potatoes, some oil (bacon grease would be better! ), and kosher salt. Easy peasy! 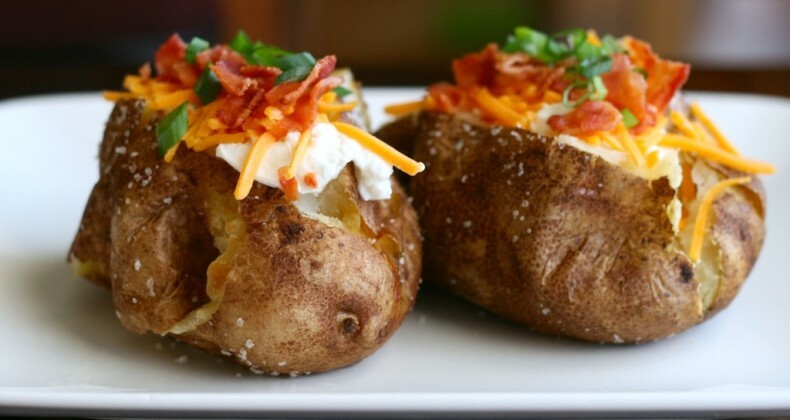 So pour yourself a cold one and enjoy these steakhouse baked potatoes in the comfort of your home. No pants required. Preheat oven to 350 degrees F. Wash your potatoes and poke numerous times with a fork or knife. Rub the potatoes in oil making sure to completely cover all sides. Place potatoes directly on the baking rack or on a foil lined baking sheet. Bake for one hour or until the potato slightly gives when squeezed. Just the other night I served only baked potatoes and other toppings for dinner. It was delicious and filling! These potatoes look unbelievable! So glad I found your blog! Yeah these potatoes are really superb and hope me to can made and eat it..lol if it come out good from my hand..lol. I started making mine this way awhile back it’s amazing what a difference that makes! Good to know Laura. P and I love sweet potatoes and I was going to give this method a try with them too. Now that is a potato! They look better than the ones I get at a restaurant. Giant baked potatoes are the best. This is a life saver! Thank you so much!